and in Cantos from Wolverine Creek, I adore ‘Pigs’ for its non-romantic look at human and ‘other’ nature. It’s like going to a spa. then sit and swell in cold mineral acid. and follow that with a cold shower. to slide down your throat so easily. She doesn’t pull punches—words and images are precise, evoking emotions we both revel in and are sometimes uncomfortable with, but only for as long as it takes to recognize them as true. My kind of thing. So when I heard she’d come out with a collection of essays I couldn’t wait to get my hands on a copy—a situation quickly remedied by a call to my trusty bookseller. The very title of the collection intrigued me. Flight Calls—An Apprentice on the Art of Listening promises a birdish focus but I suspected there would be much more. A keen observer of how nature fits into the ‘elseness’ of life as we’ve shaped it, Schmidt packs these 113 pages with connections between the incongruous and presents them as merrily wrapped gifts, the contents of which seem to surprise even her. But then the essays are about discovery and how it’s only ever the tip of the iceberg that we find; whether it be the world around us, the people in it, the essence of anything is what we remember and what we convey, and if we can manage that much, it’s plenty. In her Introduction Schmidt explains how the essays evolved from writing prompts in the form of epigraphs from her mentor, Gerald Hill. A personal letter to Hill from Schmidt runs as an undercurrent throughout, a few paragraphs of which follow each essay. It’s an intimate, strangely integral and beautiful part of the text in which the author’s voice shifts to a different kind of reflection as she shares a different part of herself with the reader. It feels like a whole other gift as our perceptions also shift and we listen in on this private revelation/confession/one-sided chat. I love a line I can pin over my desk, one that ‘snaps’ me back to a finer point of clarity, if only for a millisecond. Sometimes it’s enough to change everything. Schmidt writes gorgeously about the natural world and how she feels as she moves through it, how she’s humbled, puzzled, concerned. But never does she sentimentalize. And so, while she includes poetic elements: “Memories are like cowbirds. An image flies into mind unbidden and leaves behind an egg. It hatches early and demands to be fed. It quickly grows into a monster, removing other nestlings, but the monster is yours. You can’t stop feeding it.” you stay balanced between the beauty and the sometimes not so perfect—being charged by a bear, storms, thunder, darkness, the look in the eyes of a dying insect. She writes from the perspective of a flawed human, from awe and curiousity, stepping always closer on the reader’s behalf, and when she writes that “A Turkey Vulture lifts its head from the belly of a skunk and watches us pass.” we don’t cringe because we’ve come to trust that she’s only telling us how she finds it, sees and hears it. It’s up to us what we receive. —It’s been a delight and a pleasure not only to read her, but to have some fun with this Q&A. Please note: as is tradition in the @Eleven series, the Q&A is followed by my idea of the perfect meal to complement this book. Oh, no reason. I just like food and books. And people who like food and books. And on that note, may I present… Brenda Schmidt. 2. What were you reading at age ten? At fifteen? BS—I read anything and everything at that time. The Western Producer. Field & Stream. Outdoor Life. Reader’s Digest. The Hardy Boys. Harlequins. Zane Gray. Ludlum after Ludlum. Hemingway. 3. When did you begin writing and can you recall some aspect/premise of an early (never-before-seen-by-human-eyes-and-never-will-be-as-long-as-you-can-help-it) work? I’m wondering if nature has always been an inspiration or was there a time you wrote about the ballet or mused poetically about life as the owner of a newsstand in downtown Saskatoon… You’re also a painter. One would think it’s a perfect complement to the writing, a respite from the words. Is that how it works for you? BS—I imagine I began writing as soon as I learned to spell. Nature was it from the get-go I think. I liked playing outside, climbing trees and hanging out with other animals. I didn’t like dolls or kitchens or tea parties. I did write the odd story about love and war when I was a kid, likely influenced by the news and what I was reading. Drawing and painting used to happen right along with the writing. I’m at odds with my brushes these days. 4. Can you share a favourite line, or passage from any source… and what it means to you? I think it sums up what being a writer is all about. It sums up what I try to do. 5. Do you find certain recurring themes in your work? What are some of the things you tend to explore again and again? BS—I don’t know. Questions of theme are harder to answer each time I encounter them. I read the back covers of some of my books with nothing but curiosity. I can speak to images a little better perhaps. I do know I tend to mull over particular recurring images, but the juxtapositions are always different and so is the thinking. Images are like buckets of sand. You can build anything. The bucket makes a difference. So does water, the beach, the amount of time you’ve been in the sun. It all suggests what needs to be built at that moment. 6. Flight Calls is such a perfect title given that the essays are written as a response to the ‘call’ of epigraphs, writing prompts, from your mentor, Gerald Hill. In the Introduction, you say you were intrigued by an article about the power of epigraphs to influence the reading of a text and wondered how they “might affect the writing of a text”. You explain that while you had a sense of what you wanted to write about, i.e. ‘the art of listening’, you began the essays only after receiving all ten prompts. Was it what you expected? Were there surprises in the process of writing this collection? Is it difficult writing to an epigraph? Did some of them baffle you or merely lead you in unexpected directions? BS—I didn’t know what to expect. I was excited by the idea and just concentrated on doing the work. I decided on the title of the book before I asked Gerry for the ten epigraphs. The epigraphs were a constraint. A foundation of sound. There was no escaping them. With the epigraphs in hand, I came up with ten titles and ten ideas for essays and went from there. Each day before I began work on an essay I’d read the epigraph aloud and that was that. I trusted it would resonate in some way. Everything that followed was a surprise. I just tried to relax and let myself go wherever the essay wanted. In his book Listening, the philosopher Jean-Luc Nancy says “to listen is to be straining toward a possible meaning.” I love that. It speaks well to what I was attempting with these essays. I never did relax. I was straining the whole time. BS—What a horrifying thought. I can’t imagine. 8. It’s said that poetry grows out of attention to detail. One could say the same of all art forms, but, in your opinion, what determines how those details take shape, why these become an essay, and those a poem? And do the tools necessary to construct one or the other occupy different compartments of the mind? Or—how’s this—let’s talk cake: if the poetic form is a petit four, the essay is_______________. 9. The letter to ‘Gerry’, one page of which appears at the end of each essay. Beautiful. You sound almost daunted as you begin the project and it makes a lovely juxtaposition to the journey, through which you ultimately discover that “Listening is a full-body experience…”. I’m curious though: had you received the epigraphs yet when you wrote the letter? I’m wondering at your mood and what you wanted to get across to him that you didn’t think the essays would. BS—Thank you. Like the essays, the letter was written after I received the epigraphs. I initially thought I’d link the essays with linked prose poems as a way of going back in and rethinking and responding, of straining some more, but after staring at the epigraphs on my bulletin board it struck me that I never call him by the given, formal “Gerald.” I call him “Gerry,” personal and familiar. The structural potential hit me then. I thought I’d address him directly in an apprentice-to-mentor letter and see what happens. 10. You’re a pretty serious birder. With a cat. Any conflicts there? Fall or Spring? Fall AND spring. Times of migration. Heavenly seasons. Pen or Keyboard? Keyboard nowadays. Bob Dylan or Dylan Thomas? Bob some days, Dylan others. I’m so inconsistent. Pizza or Pasta? Pizza. Homemade, topped with just a little olive oil and feta. Ptarmigan or Owl? Ptarmigan. They are the imagination embodied. I imagine an owl will be the last thing I hear before I croak. Fruit or Veg? Veg. Not a fan of citrus. Oranges are scary. Apples are weird. Canoe or Kayak? Kayaks excite me when I see them. I think I’d be too squirrely for a canoe. Canoeists seem so composed. I can’t swim, so I have nothing to do with either in any real way. Mittens or Gloves? Mittens! My fingers hate to be separated. Fiction or Non? Trick question! Desert Isle or Ice Hotel? Ice please. Heat kills me. Butterscotch or Strawberry? Butterscotch. Strawberries kill me. 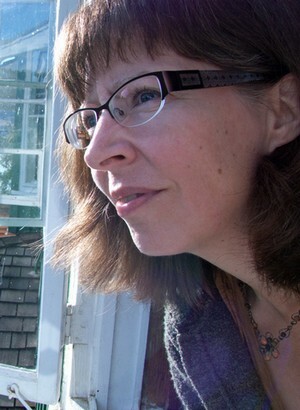 Brenda Schmidt is a writer, visual artist and naturalist based in Creighton, a mining town on the Canadian Shield in northern Saskatchewan. She is the author of four books of poetry, A Haunting Sun (Thistledown Press, 2001), More than Three Feet of Ice (Thistledown Press, 2005), Cantos from Wolverine Creek (Hagios Press, 2008), Grid (Hagios Press, 2012), and a book of essays Flight Calls: An Apprentice on the Art of Listening (Kalamalka Press, 2012). 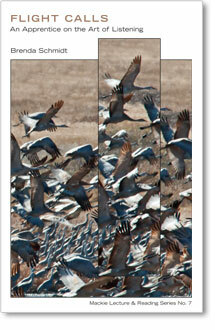 Both Grid and Flight Calls are shortlisted for Saskatchewan Book Awards. Lovely piece this — thanks for it, and for the great interview with Brenda. Flight Calls is a remarkable and entrancing book. Hi, I too enjoy reading this. I’m going to apply those questions to my creative writing students this aft, maybe make up some new ones too.